Cao, L. and Zhu, W. (2016). Acid Extraction of Total Histone from Colon Cancer HCT116 Cells. Bio-protocol 6(22): e2023. DOI: 10.21769/BioProtoc.2023. Histone acid extraction assay is a popular method to determine histone modification levels in mammalian cells. It includes three steps: first, histones are released from chromatin by sulfuric acid; trichloroacetate (TCA) is then added to precipitate histones; and finally, histones are dissolved in double-distilled H2O (ddH2O). Here we present a detailed histone acid extraction assay in our laboratory using a colon cancer cell line, HCT116, as a model. The nucleosome is the fundamental unit of eukaryotic chromatin, which is composed of a histone octamer (2 copies of H3, H4, H2A, H2B, respectively) wrapping by DNA (Strahl and Allis, 2000). The amino terminal of histone is subjected to a variety of post-translational modifications, such as methylation, acetylation, phosphorylation, ubiquitylation and sumoylation (Kouzarides, 2007). Although the function of these modifications has remained elusive, there is ever-growing studies suggest that histone modifications play vital roles in intracellular processes (Bannister and Kouzarides, 2011). Therefore, it is important to extract histones efficiently to detect histone modifications. Histones can be extracted via different methods, in which histone acid extraction assay is one of the most popular procedures. It does not interrupt post-translational modifications of histones, and so it is very good for histone modification analysis. 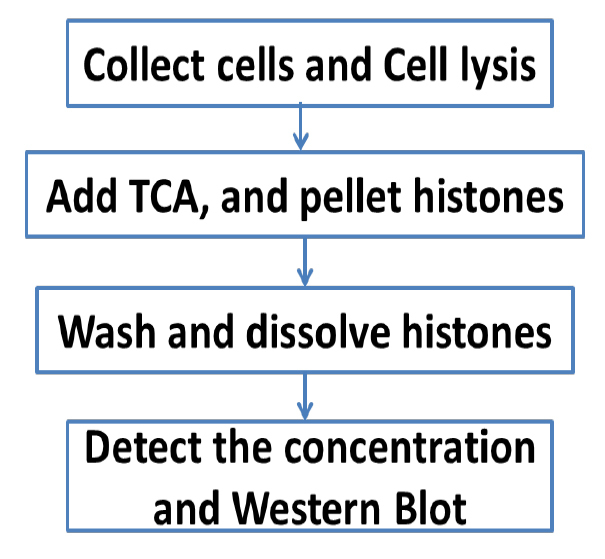 It has been tested that the extracted histones can be used in Western blot, and maybe other assays (not fully tested). However, immunoprecipitation is not recommended. In this protocol, we will present a detailed histone acid extraction assay, and describe how to release histones from chromatin, how to precipitate histones, and how to wash and dissolve histones in ddH2O. An overview of the whole procedure is schematized in Figure 1. Collect HCT116 cells (6 cm plate, 70-90% confluent) using any commonly used method in 1 ml ice-cold PBS and pellet (1,000 x g, 5 min, 4 °C). Discard the supernatant, add 1 ml ice-cold PBS and pipet gently to resuspend the cells, then pellet it again (1,000 x g, 5 min, 4 °C). Discard the supernatant, resuspend cell pellet in 400 μl lysis buffer, and incubate for 30 min with rotating at 4 °C. Pellet the intact nuclei by spinning in cooled centrifuge (12,000 x g, 10 min, 4 °C). Transfer the supernatant containing histones into a fresh 1.5 ml tube. Add 133 μl TCA drop by drop to histone solution and invert the tube several times to mix the solutions (final concentration of TCA is 25%). (It is better to add one drop and invert the tube at once to mix the solutions, and then add another drop.) The solution will appear milky over time. Incubate on ice for 30 min or overnight. Pellet histones by spinning in cooled centrifuge (12,000 x g, 10min, 4 °C). Carefully remove supernatant and wash histone pellet with 1 ml ice cold acetone without disturbing it. Acetone is used to remove acid from the solution without dissolving the histone pellet. Spin down in centrifuge at 12,000 x g, 10 min at 4 °C. Repeat steps 9 and 10 to wash histone pellet again. Carefully remove all of the supernatant and air-dry histone pellet for 30 min at room temperature. Dissolve histone pellet in appropriate volume of ddH2O (for example, 100 μl is appropriate for a 6 cm plate), and transfer into fresh 1.5 ml tube. Detect the concentration of histone solution with the spectrophotometer (using OD 280), and we may acquire 1-2 µg histone protein from a 70-90% confluent well on a 6 cm plate. Add the same volume of 2x SDS loading buffer into histone solution, and boil it on the metal bath (100 °C, 5 min), then subject to Western blot. Figure 2. 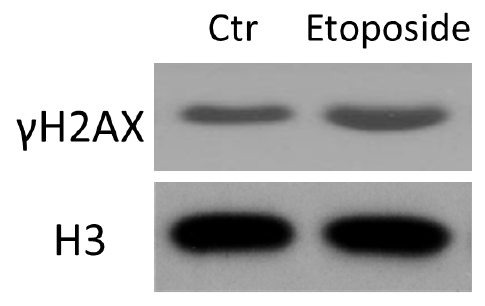 HCT116 cells were treated with etoposide and subjected to histone acid extraction. Immunoblotting was performed with the indicated antibodies. Note: Relative Western blots have also been published in our paper Oncogene (Cao et al., 2016). For details, please refer to Figure 4 in Cao et al., 2016 (https://www.researchgate.net/publication/274316705_ATM-mediated_KDM2A_phosphorylation_is_required_for_the_DNA_damage_repair). This work was supported by Beijing Natural Science Foundation grant 7164305, the ‘973 Projects’ (2011CB910100, 2011CB504200 and 2013CB911000), National Natural Science Foundation of China (81222028, 81321003, 81472581, 81530074, 31570812 and 91319302), and grants (B70001) from the Ministry of Science and Technology of China. This protocol was adapted from previous work published in Cancer Research (Zhu et al., 2001), Oncogene (Cao et al., 2016) and Oncotarget (Lu et al., 2015). Bannister, A. J. and Kouzarides, T. (2011). Regulation of chromatin by histone modifications. Cell Res 21(3): 381-395. Cao, L. L., Wei, F., Du, Y., Song, B., Wang, D., Shen, C., Lu, X., Cao, Z., Yang, Q., Gao, Y., Wang, L., Zhao, Y., Wang, H., Yang, Y. and Zhu, W. G. (2016). ATM-mediated KDM2A phosphorylation is required for the DNA damage repair. Oncogene 35: 301-313. Kouzarides T. (2007). Chromatin modifications and their function. Cell 128: 693-705. Lu, S., Yang, Y., Du, Y., Cao, L. L., Li, M., Shen, C., Hou, T., Zhao, Y., Wang, H., Deng, D., Wang, L., He, Q. and Zhu, W. G. (2015). The transcription factor c-Fos coordinates with histone lysine-specific demethylase 2A to activate the expression of cyclooxygenase-2. Oncotarget 6(33): 34704-34717. Strahl, B. D. and Allis, C. D. (2000). The language of covalent histone modifications. Nature 403(6765): 41-45. Zhu, W. G., Lakshmanan, R. R., Beal, M. D. and Otterson, G. A. (2001). DNA methyltransferase inhibition enhances apoptosis induced by histone deacetylase inhibitors. Cancer Res 61(4): 1327-1333. How to cite: Cao, L. and Zhu, W. (2016). Acid Extraction of Total Histone from Colon Cancer HCT116 Cells. Bio-protocol 6(22): e2023. DOI: 10.21769/BioProtoc.2023.